Some photographers, like portrait and sports photographers, never or rarely use tripods; however, anyone who wants to shoot landscape, night, or wildlife photography rely heavily on a solid tripod. Frankly, most tripods are absolute junk. I've purchased about 9 tripods while moving up the ranks of photography. Some of them simply weren't sturdy enough, others were too heavy or inconvenient, some weren't durable, and some were fantastic. I spent several thousands of dollars on different tripods trying to find a “deal” until I finally realized how many junkie tripods I had bought and money I had wasted. I finally invested in a high quality tripod, and it has lasted the test of time. This page is full of the information I wish I had back then. I've spent the last few years testing and reviewing dozens of tripods and putting them through their paces, and these are the absolute cream of the crop. But “cream of the crop” doesn't have to mean expensive. I've found lots of great tripods that are reasonably priced that are actually better than the expensive stuff. I'll recommend several tripods to you below and let you pick the one that best fits your situation. 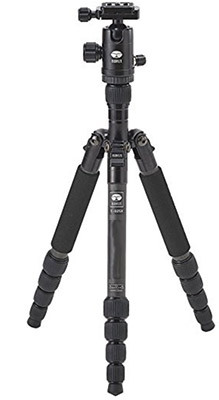 If you have only $200 to spend, then I can highly recommend the Sirui T-025x Tripod and Ballhead combo on Amazon.com. Yes, I know it has a weird name. It's pronounced “Soo-ray”, and it's a Chinese company that makes extremely high quality tripods and ballheads for very reasonable prices. It's incredible that you can buy this carbon fiber tripod for under $200. 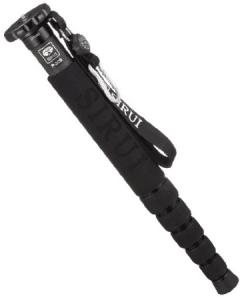 Usually, carbon fiber tripods cost a lot more, but Sirui has always had great prices. Another thing I like about the head on this combo is that it's Arca-Swiss compatible. That means the little quick release plate that screws onto the bottom of your camera is a standard shape and size so you can buy an l-plate for your camera and much more easily attach the camera in portrait orientation. Read more about L-Plates here, and GET ONE for your camera! You won't regret getting the L-plate. Every serious photographer I know uses an L-plate. The Feisol is like a dream. It's incredibly lightweight with its carbon fiber frame, it has no center column so it can get down right to the ground, it's a tall enough height to comfortably reach to the eye line of most adults, and it's priced reasonably if you compare it to the competition. The Feisol is my favorite tripod of all time. It's lasted many many airports, being dunked in salt water, dragged over the black sand beaches of Iceland, falling in the water in China, etc. I've compared the Feisol to all the top tripods. The Really Right Stuff Tripods are amazing, but significantly heavier than the Feisol that I like. The Gitzos are hit and miss with durability, but have great features and specs. The Feisol usually runs around $400, but you can check the current price on Amazon here. Read Jim's full review here. Not sure what a ballhead is? Click this link to find out all about ball heads. It's the piece that attaches the camera to the tripod. Pro tripods don't include both pieces generally. I promise it'll be worth it to buy a nice ballhead. You can certainly find many inexpensive ballheads, but I promise they'll eventually wear out over time and break on you. I think I bought 6 or 7 ballheads before I finally wised up and bought a pro quality head. There is only one ballhead I'd recommend that does a really nice job at a budget price range. It's called the Sirui K10X. “Sirui” is pronounced “Soo-ray” (I know–weird). When I teach workshops, about half of my students show up with this ballhead. Great budget option. It's still not cheap, but it's the cheapest one that will last you for several years without issue. Sirui makes this head in several different sizes. If you have anything other than a full frame camera (very heavy), then I'd recommend getting the K10x. If you shoot a large full frame camera with big lenses, then I'd recommend getting the Sirui K40x (affiliate link to Amazon). It's just a larger size of the same head. I'm currently shooting a RRS BH-40 ballhead. It has been super reliable, strong, and reasonably lightweight; however, it really has no cool features. If you're buying a new ballhead today and you want one that will last you forever and that will definitely perform for you, I'd buy the Really Right Stuff BH40 Ballhead with lever release and full-size clamp. It's definitely pricey, but if you want the very best, I think that's it. L Plates: My Favorite Camera Accessory!!! If you're purchasing a ballhead, I HIGHLY HIGHLY HIGHLY recommend you also get an L-plate. The good news is that an L plate is very inexpensive, but they will make your ballhead much more useful. I wrote a complete post about what an L Plate is, where to buy one, and why I never shoot without an L plate. I haven't tested nearly as many monopods as I have tested tripods, but the one I bought four years ago is still going strong, is remarkably sturdy even with sideways pressure like when holding flashes, is lightweight, and collapses very small. I'd definitely recommend it. It's called the Sirui P-326. It's a 6-section so it collapses really small. The thing I like about this one is how sturdy it is. I've shot with a 600mm on this monopod–no problem. It also is strong enough to be used as a light stick for flash photography. Many monopods aren't strong enough to handle the sideways pressure of holding a flash extended with a heavy modifier, but this one handles it well. Highly recommended. Check the current price of the Sirui P-326 on Amazon. hi! So can you pair the AT313 with K10X with no problems? Thanks! @Vince – No problem at all. Piyush Das – All ballheads fit all tripods. The screw threads are standardized. Thanks for the prompt reply ..:) ordered my gear n excited to use it..
What about geared heads? I’m into real estate photography and the experts there say a geared head provides WAY more control and stability than a ball head. Will the Vanguard SBH-300 take an Arca Swiss mounting plate. I need to use that system because I use a Kirk L Bracket on my cameras. Jim. do you pair a light ball head with your Feisol tripod and if so, which one? I already own the usual heavy Manfrotto tripod and Kirk BH-3, but is there a better (lighter) ball head for travel to pair with the Feisol that I plan to buy? I have a 70-200mm lens and a 300mm lens with a 1.4 extender and think that the Feisol would only hold the smaller lens, maybe with the extnder on my 3ti. Is that correct? Thanks very much. I love your podcasts! Hi Vince! Did your combination work? I’m looking for my first tripod to buy. Does yours wobble when using it? Should I buy it? Thanks! Hi, do you have any recommendations on where to find a good camera bag or if not, what to look for in one? My husband and I are beginner photographers. I see you like the Feisol CT-3442 tripod, I am considering the CT-3472, which I see available used for same price as a new CT-3442. I don’t mind a little extra weight and think I’ll enjoy the extra height but am wondering if you think I’d get extra stability with the larger tripod. I generally use a lightweight setup with a Canon 60d and smaller lenses. Also, is there anything I should be concerned about with a used tripod? I figured there aren’t many parts though would wear, but I don’t really know. I bought the cr-3472lv. Looks like a monster. Now I need a true travel tripod to compliment it when I don’t want to lug that thing around. 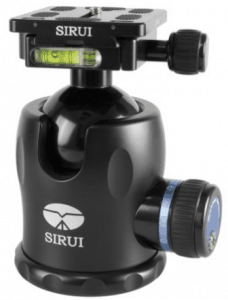 I just ordered the Induro tripod but I’m having trouble ordering the Sirui ball head on the site that the link brought me to. There is no way to “add to cart” and no contact info to ask questions. Is there another good place to order this from? Amazon or any others? Check out the Vanguard tripods. Great bang for your buck. They have both aluminum for budget and carbon fiber for light weight . Also have ball, pan and other heads. Great tripods that can do amazing angles and get into all positions down low or upside down or macro. Great site – just ordered the Induro AT-313 tripod and Sirui K10X ball head on the strength of this so looking forward to getting my hands on them next week for some serious tripod work! I purchased the AT-413 tripod (for additional height) and Sirui K10X ball head this past January (2014). I’m absolutely thrilled with the purchase. The quality of the construction for both items is impressive. Smooth movement of the tripod legs and the head locks in place without having to apply a lot of pressure on the knobs. When releasing the head pressure the camera doesn’t flop over. The Sirui head also features a safety button that protects the camera from sliding off the mount when releasing the pressure. I highly recommend it. You need to get a Three Legged Thing Brian tripod with the Airhead 2 simply the best. for the Induro tripod you recommended? I have the Induro tripod and the vanguard ball head and I love them both. I wish that I would not have bought so many cheap big box store tripods. can u please help me to choose one of these tripods ? but I couldn’t find it in market. I have a BENRO A500F tripod. It seems to be a solid tripod with a ball head. Have you ever worked with such or similar tripod? Do you believe it is a solid one? I’m sorry if it sounds silly, but will the recommended Vanguard SBH-300 fit your recommended Manfrotto 7322YB or Induro AT-313. Also, will it support D700 with 70-200mm lens or will it be too heavy?